The holistic education of our students is a core value here at Institut Montana Zugerberg. As part of that, our students engage in various charity projects. 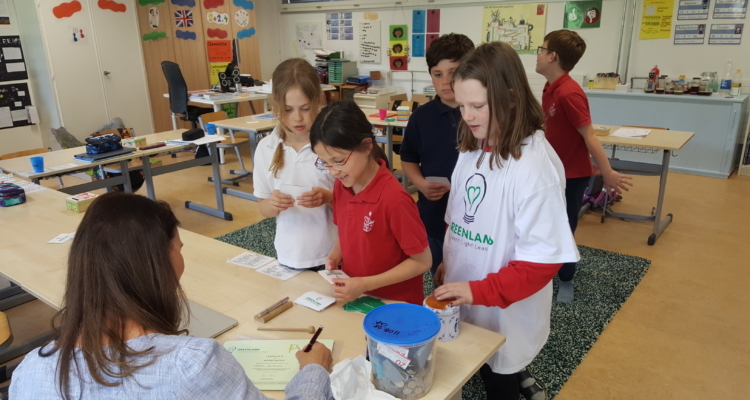 For example, our fourth graders of the Bilingual Elementary School who support the charity project «Greenlamp» with their class advisor Christin Büscherfeld. Since 2012, Greenlamp has reached over one million women and touched the lives of five million people in rural Ethiopia. Greenlamp’s mission is to empower women and girls through education, health care and technology, enabling them to bring social and economic change to their own communities. A subproject is solar lamps in suitcases, which the midwives take with them when they are called to births in remote areas where there is a lack of natural light and infrastructure. In April, Joanna Boyd visited the class again to collect the money. She also told the students of her last journey to Ethiopia as a Greenlamp ambassador, when she visited midwives. Overall, the impressive sum of CHF 1′108.30 was collected. Those children who collected more than CHF 100,00 were given a Greenlamp T-shirt and each child received a donation certificate. The children were very proud of the sum they achieved. Brillantmont International School Lausanne, Switzerland celebrates its 135th anniversary.